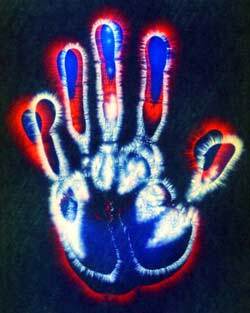 All humans, animals and even plants possess an electrical aura around them. This aura is actually an electrical cloud or field. Some people seem to be able to sense such an aura in others. How is sensing an aura explained? One aspect of life is electrical. Your muscles contract as a result of electrical impulses. Your heart gives off electrical signals that doctors can measure with an electrocardiogram. Your brain also gives off electrical signals that doctors can measure with an electroencephalogram. The electrical signals that come from your muscles, heart, brain and other parts of your body result in an electrical field—somewhat like a cloud of electrical charges—that surrounds you. One interesting theory about a person's electrical signals is that if your mind and heart are in harmony, their electrical signals are in synch. This results in a stronger aura and apparently better health. Some people claim that they can visibly see this aura around other people. Others claim to be able to sense another's presence in the dark. Although many scientists scoff at this as a person's imagination, it is possible that these people are actually using a sense that is very weak in most people. And that would be the ability to sense an electrical field. Sharks and eels detect their prey, as well as other members of their species, through sensing electrical signals transmitted through the water. It is not certain how many other animals have this sense. Humans may also be able to detect electrical signals, but since that sense is so weak in most people, it is not really noticeable or useful. If people can sense electrical fields, it is also possible that those people who claim to be able to sense the aura of another person may have this electrical sense more sensitive than most everyone else. This is similar to how some people seem to be able to sense future events through the use of their 6th sense more than others can. But also, people who claim to be able to sense the aura of another person should also be able to sense the aura of a plant or animal on occasion. All living beings have a weak electrical cloud surrounding them. Some animals, such as sharks, are able to sense the electrical fields in other animals. Humans may also have that sense, but it is too weak to notice. Some people may have the sense strong enough for them to see or feel the aura of other people. Use your special senses to improve the world.